The first time was in an older-than-I-am privateer taxi, piloted by a disinterested driver. This time, I rode in a relatively new VW turbodiesel Pickup truck driven by Mauricio Neves and Leandro Ferrarini - one of Brazil’s best rally duos. Considering that I made it in one piece with a random dude in a car that has seen a quarter of a century of action, this drive should be smooth sailing. After about 70 kilometers of rocketing over mountains, the charge pipe announced its decision to quit with a loud “bang!” followed by a furiously flashing check engine light. Due to some significant ECU intervention, the diesel motor still produced some power sans boost, so Mauricio limped the truck to the nearest pull out/sketchy mechanic stop to see what they could do. Fix #1: Good for the rest of the rally, not the trip. By the time I got my camera out, Mauricio and Leandro had already excavated the charge pipe - rent asunder by the force of air pumped by two turbos. Within seconds, they cut rubber strips from a floor mat and tied the tear in the pipe closed. To add the extra air-tightness needed to direct 1.5 bar of air into the engine, they wrapped it in packing tape. After tearing out of pullout, we heard a pretty loud “woosh” that could be controlled by the accelerator. But the engine was (mostly) holding boost, so we returned to our previous conversation as we wound through the mountains. And we would’ve gotten away with it if it wasn’t for the meddling ECU. Apparently the car wasn’t happy with the significant boost leak, so after 15 km it threw the car back into limp mode. 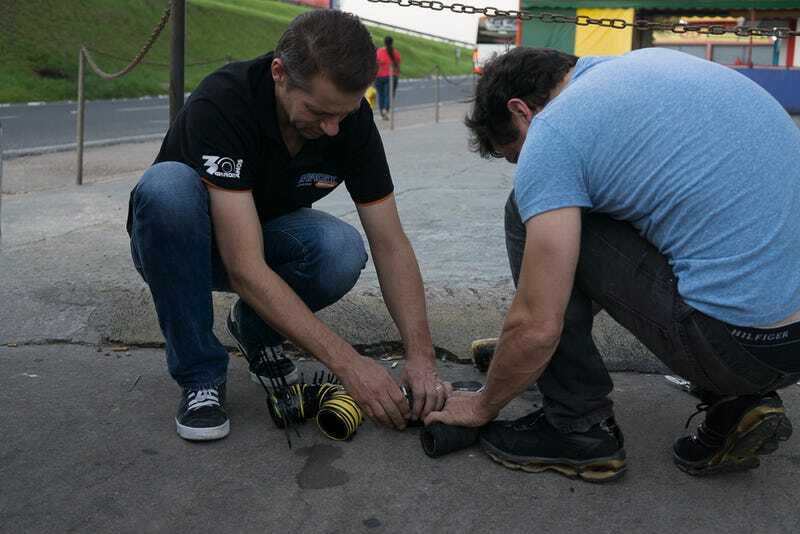 Unlike rally stages, our drive had far more than 15 km to cover, so a new fix was needed. Fix #2: Let’s try zip ties! After somehow getting the car into the next town, they quickly found a store with heat resistant tape, duct tape and zip ties. Off went the packing tape and the rubber strips, and on went thermal tape and a healthy wrapping of yellow duct tape. For additional security, numerous zip ties secured the split pipe closed. A nuclear accident at the caterpillar farm or a fixed part? Initial stress testing in the parking lot seemed to prove that the yellow spiky caterpillar could hold air. So, for the second time, we departed on our merry way. Unfortunately, a hard pull onto the highway brought back the throttle modulated “woosh” (albeit a bit softer). And with the boost leak returned the pissed off ECU. At this point they decided to just buy a new part. So while Leandro called all the local VW dealerships, Maurico, without stopping, restarted the car every time it even thought about going into limp mode. The problem was apparent when we pulled into the next town. The original tear had formed right next to the turbocharger, and as the burns on their arms can attest – turbos are hot. So effectively, the turbo melted through whatever patch we threw at it. Adding to the problem, none of the nearby dealerships had the part. Using a new charge pipe of the same diameter (but not the same shape), the duo excised the blown out part of the old pipe and cut elbow bends out of the new one to match the removed tubing. Parts of an old exhaust pipe, commandeered from a nearby tire shop, bridged the different sections, and six hose clamps boost-proofed the joints. After re-installation, extensive in lot testing provided a modicum of trust in the part. Turns out we should have had more faith as the part not only carried us the remaining 350 km, but held as Mauricio threw the pickup truck through 120 km of Recce runs and the 500 km return journey.